Our fun beat-the-winter-chill fundraiser returns for a 6th year! 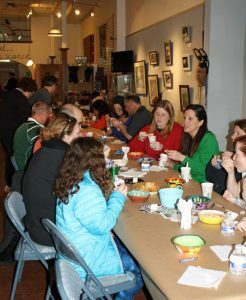 We hope you will join us for an amazing variety of homemade soups, created by our volunteer chefs and local restaurants. Your meal also includes bread, beverages and homemade desserts. 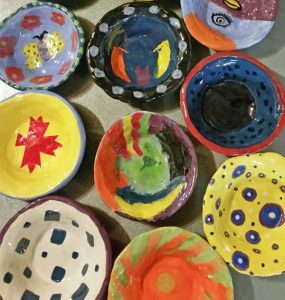 As a thank you for supporting our event, you will take home a hand-crafted ceramic bowl created by our wonderful volunteers throughout this past year. Ticket are $20 in advance and $25 at the door. Tickets are available online here until 5pm on 1/27. Snow date: Saturday, February 4. This year’s soup varieties include: Vegetarian Mushroom, Butternut Squash, Ham and Bean, Hungarian Goulash with Spaetzle, Chicken, Vegetarian Mulligatawny, Potato Leek, Miso, Thai Sweet Potato and Carrot, Spartan Slayer Stew, Chicken Cider Stew, Gluten Free Vegan Tortilla, Spinach Rosemary, Zuppa Tuscano, Wedding Soup and much more! A big thank you to Panera Bread for once again donating their fabulous baguettes for this fundraiser! In addition to our wonderful individual Soup Chefs, Lily’s Grill, Grumpy’s, Potts and Penn Diner, iCreate Cafe, Ice House and Montesano Bros. will all be donating their yummy cuisine for this fundraiser.